Talus is a tarsal bone of hindfoot. 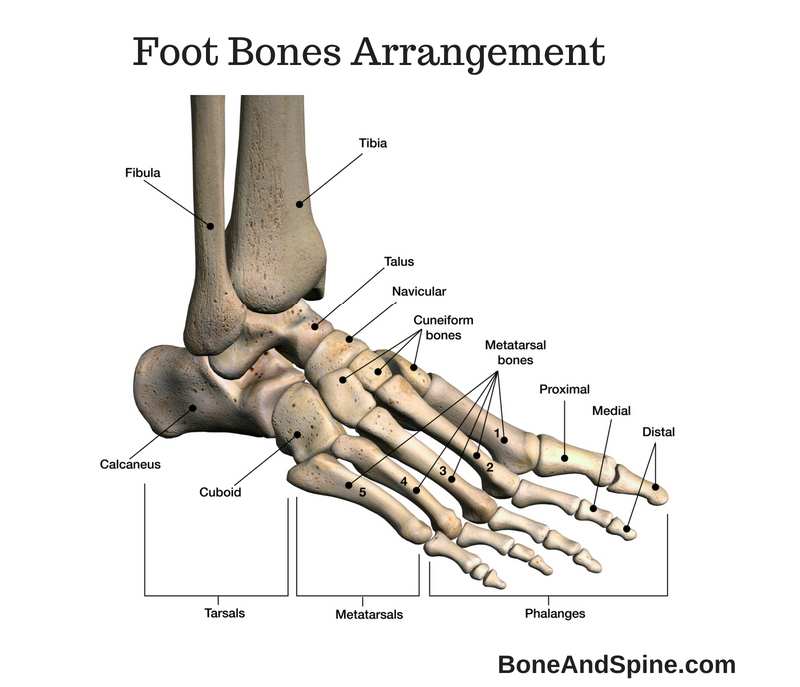 There are about 26 bones in the human foot grouped into 3 parts – tarsal bones, metatarsal bones, and phalanges. Hindfoot is formed by talus and calcaneus, two of the seven tarsal bones. Rest of the five tarsal bones form midfoot. Forefoot contains the metatarsals and the phalanges. The talus is the second largest tarsal bone and is situated above the calcaneus in the hindfoot. Talus is a unique bone. Two-thirds of the talar surface is covered with articular cartilage. Neither tendons nor muscles insert or originate from this bone. The talus articulates with 4 bones: the tibia, fibula, calcaneus, and navicular. The rounded head is directed forwards. The trochlear articular surface of the body is directed upwards, and the concave articular surface downwards. The body bears a large triangular facet laterally, and a comma-shaped facet medially. Talus is composed of body, neck and head. It also has two processes- the lateral and posterior. The body is cuboidal in shape and has five surfaces. The superior surface is also called trochlear surface and bears an articular surface, which articulates with the lower end of the tibia to form the ankle joint. It is shaped like a pulley, with the groove of the pulley termed the trochlea, closer to the medial border. It is convex from before backwards and concave from side to side. It is wider anteriorly than posteriorly. The medial border of the surface is straight, but the lateral border is directed forwards and laterally. In front, it is continuous with the upper surface of the neck of the bone. It bears an oval, concave articular surface called posterior facet or posterior calcaneal articular surface which articulates with the posterior facet of the calcaneum to form the subtalar joint. The posterior calcaneal articular surface is deeply concave in the direction of its long axis, which runs forward and lateralward at an angle of about 45° with the median plane. It has two parts. Upper comma-shaped part is articular above and the lower part is non-articular. The Articular surface articulates with the medial malleolus. Under the tail of the medial malleolar facet, the posterior half of the inferior portion consists of a large oval area that provides insertion for the deep component of the deltoid ligament. The lateral surface bears a triangular articular surface for the lateral malleolus. The surface is concave from above downwards, and its apex forms the lateral tubercle of the talus. It is continuous above with the superior articular surface with posterior part of the being separated from the trochlea by an ill-defined, small triangular area which articulates with the inferior transverse tibiofibular ligament. Along the anterior, inferior, and posterior boundary of the articular surface is the lateral process, a nonarticular component of the talus. Along the posteroinferior border of this lateral surface lies a groove for the attachment of the posterior talofibular ligament. The lateral talocalcaneal ligament inserts at the inferior tip of the lateral process. The anterior talofibular ligament inserts at the anterior border of the triangular lateral process at 2 tubercles. The posterior surface is small and is small and is marked by an oblique groove. The groove is bounded by medial and lateral tubercles. Tendon of the flexor hallucis longus passes through the groove. A posterior tubercle is also present. Sometimes it is separate and in such cases, it is called os trigonum. The posterolateral tubercle is more prominent of the two and gives attachment to the posterior talofibular ligament. This is the constricted part of the bone between the head and the body. It is set obliquely on the body so that inferiorly it extends further backwards on the medial side than on the lateral side. When viewed from the dorsal side, the long axis of the nack is directed downwards, forwards and medially. The neck-body angle is 130 to 140 degrees in infants and 150 degrees in adults. This portion of the talus is most vulnerable to fracture. The neck has 4 surfaces- superior, lateral, medial, and inferior. The superior surface of the neck is limited posteriorly by the anterior border of the trochlea of the talus (the dome or body) and anteriorly by the articular surface of the talar head. The tibiotalar capsule inserts along this superior surface just proximal to the insertion of the capsule of the talonavicular joint. The lateral surface of the neck is concave and is continuous below with the deep groove for the interosseous talocalcaneal ligament. It provides an insertion for the medial aspect of the inferior extensor retinaculum. The inferior surface of the neck forms the roof of the sinus tarsi and sinus canal. It forms a deep groove called sulcus tali which separates the posterior facet of body and middle facets on the head. The groove runs obliquely forward and lateralward, becoming gradually broader and deeper in front. A similar groove is on upon the upper surface of the calcaneus, and both the grooves together form a tarsal canal termed the sinus tarsi. It contains interosseous talocalcaneal ligament. Inferior surface of the neck contains numerous holes for nutrient arteries. The medial surface provides an area for insertion of the talonavicular ligaments. Head of the talus is directed forwards and slightly downwards and medially. Its anterior articular surface is oval and convex. The long axis of this surface is directed downwards and medially. It articulates with the posterior surface of the navicular bone. The inferior surface is marked by three articular areas separated by indistinct ridges. 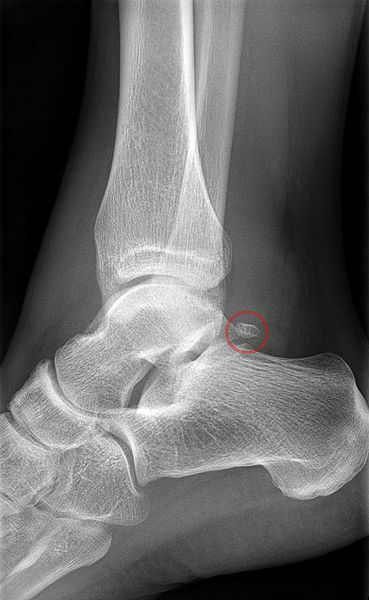 The middle facet is largest, oval and gently convex; it articulates with the middle facet of the calcaneum. The anterolateral facet articulates with the anterior facet of the calcaneum, and the medial facet with the spring ligament. The head of the talus nests within an articulation known as the acetabulum pedis, or foot socket formed by the calcaneal middle and anterior surfaces connected to the large navicular articular surface by the inferior and superomedial calcaneonavicular ligaments. The following video would make understanding the anatomy easier. The talus is devoid of muscular attachments, but numerous ligaments are attached to it because it takes part in three joints. The lower, non-articular part of the medial surface of the body gives attachment to the deep fibers of the deltoid ligament. The groove on the posterior surface lodges the tendon of the flexor hallucis longus. The medial tubercle provides attachment to the superficial fibers of the deltoid ligament above and the posterior talocalcaneal ligament. The distal part of the dorsal surface provides attachment to the capsular ligament of the ankle joint and to the dorsal talonavicular ligament. The proximal part of the dorsal surface lies within the ankle joint. The inferior surface provides attachments to the interosseus talo-calcaneal and cervical ligaments. The lateral part of the neck provides attachment to the anterior talofibular ligament. The talus ossifies from one center which appears during the sixth month of intrauterine life. Talus bone is supplied by the posterior tibial and anterior tibial artery through various branches. Negligible contribution can be through peroneal artery. The following video would explain the importance of blood supply of talus. Artery of tarsus canal arises from posterior tibial around 1 cm proximal to its division and passes anterior to flexor digitorum longus. It enters the tarsal canal [another structure present is the interosseous ligament] and gives branches to talus which enter the talus from the medial and inferior side. It is a branch of the artery of the tarsal canal. Sometimes it takes its origin from the posterior tibial artery. Superior neck branches are given by Dorsalis Pedis. Artery of the tarsal sinus is formed by anastomosis of the branch of the Dorsalis Pedis that crosses the navicular (lateral tarsal branch) and the branch of the perforating peroneal artery. In habitual squatters, a squatting facet is commonly found on the upper and lateral part of the neck. The facet articulates with the anterior margin of the lower end of the tibia during extreme dorsiflexion of the tibia during extreme dorsiflexion of the ankle. The acetabulum pedis has a variable volume capacity and adapts to the changing position of the talar head during gait.